A ceiling fan is one of the most useful home appliances and does the job of providing us with cool air during summer months. The conventional ceiling fans work directly through single phase induction motors. A motor is definitely the most important part of any ceiling fan as upon it depends on its performance and operation. If the motor goes faulty, the fan won’t work and you may have to get it repaired. As mentioned above, most conventional ceiling fans make use of single phase induction motors. Due to the fact that these motors make use of minimum power consumption, they are also referred to as fractional kilowatt motors. The reason why single phase induction motors are needed in ceiling fans is because they are easy to handle and also convenient to repair. They are cost effective and simple in their design. They prove to be an economical choice as far as home and office use is concerned. The power output of loaded supplies is small and this is another reason they are used widely. 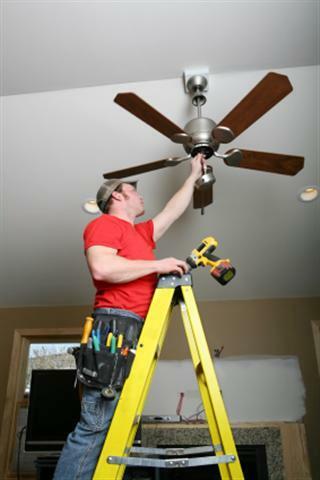 Ceiling fans work on induction motors which convert electric energy into mechanical energy. The capacitor of these fans torques up the electric motor which makes it run just after the start. What happens is that the current reaches the motor and then makes it way towards the coil which is wrapped around the metal base. Now as the current conducts in the wire, a magnetic field is formed and this puts force in a clockwise direction. This further converts electric energy into mechanical energy. Through this action, the motor coil begins to rotate. Now that you know the working of a ceiling fan motor, you must be able to understand the possible causes of motor defects. The following are some possible ceiling fan motor problems and their solutions. Overheating can lead to ceiling fan motor failure and this is usually a result of dust and other particles accumulating and clogging up the motor. In this case, ceiling fan motor repair may not be possible and the only solution is to replace it altogether. Another reason for ceiling fan motor defects is failure of the switch. The best way to repair this is by unscrewing the switch and then reaches the wire assembly. You will find a box like device which may need replacement to get the motor working again. High moisture can be another reason for ceiling fan motor failure. Moisture causes rusting of parts of the motor such as the bearings. Oil your bearings frequently to avoid this problem. If too much dust and dirt comes in contact with the motor and forms a layer over it, then this too can be a cause of motor failure. This is why it is important to clean and dust the fan on a regular basis. Now that you know about ceiling fan motor repair, you can easily solve the issue at home or call an electrician to help you with it. It is important to clean your fan on a regular basis and also take care of avoiding moisture from entering it.